A trip to the grocery store might leave you wondering if a healthy snack bar can exist without needing a dictionary to decipher the list of ingredients. Good news is you can make them at home with little effort. Even better news is these gluten-free date bars are also vegan and nut-free, making them a great allergy-friendly alternative to store-bought granola bars for school lunches. The thick, caramel-like filling nestled between layers of soft oat crumb only seems decadent. In reality, it’s pureed dates that whip up into an amazing (we might even say magical!) vegan caramel when blitzed in the food processor with lemon juice, cinnamon, vanilla, and a pinch of salt. 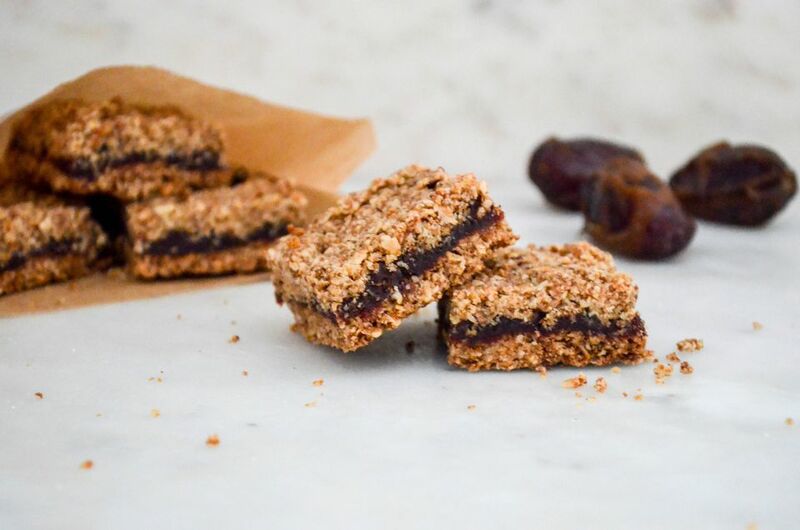 One bite, and you’ll be pleasantly surprised knowing these date bars are also refined sugar-free. Add the dates to a medium-sized bowl. Add enough hot water just to cover the dates. Let them soak for 15 minutes. Meanwhile, prepare the oat crumb layer. Add 1 cup of oats to the bowl of a food processor. Process until it breaks down into a flour consistency, about 1 minute. Add the remaining oats, sugar, flaxseed meal, salt, tahini, and coconut oil to the food processor. Pulse just until it comes together into a sandy, clumped mixture. Transfer to a bowl, and wipe the food processor bowl clean. Drain the dates, slip the skins off (discard the skins), and add the fruit to the food processor bowl, along with the lemon juice, cinnamon, and salt. Pulse a few times to break up the dates, then process until it becomes a creamy, whipped caramel consistency, 2 to 3 minutes. Press half of the oat crumb mixture into the bottom of the prepared pan. Spread the date filling over the crumb layer. Sprinkle the remaining crumb mixture on top, gently pressing it into the filling. Bake 30 to 35 minutes, until the top is deeply golden. Let the bars rest in the pan until completely cooled. Lift the parchment out of the pan. Cut into 16 bars. Store bars in an air-tight container for up to 5 days.